I guess we could say my sewing skills have came a long way. Now I am trying my best to “hack” Molly’s Christmas dress from Butterick 6149. I don’t usually try to draft out entire pattern pieces. Mainly, I just make little modifications like lengthening a t-shirt pattern to a dress sort of thing. I started with Butterick 6149 because I would not need to make changes to the bodice. I used view B for my dress especially since it was short sleeved. I tried changing a gathered skirt to the A-line skirt to match the original outfit. It was close but I ended up “fixing” the front by trimming length off it. Looking at the compare pictures at the bottom of the post, my skirt is close to the original but slightly off. I am not sure what I did wrong but I am at least close. Anyways, it may just be fabric choice. 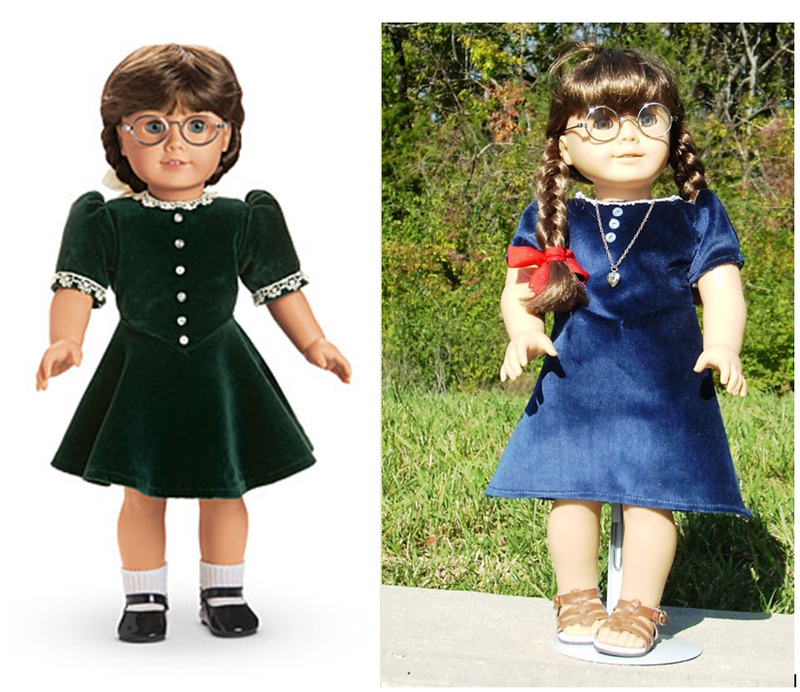 The big question I have is where did American Girl get the velvet to make Molly’s dress. I picked my fabric up from Fabric mart. 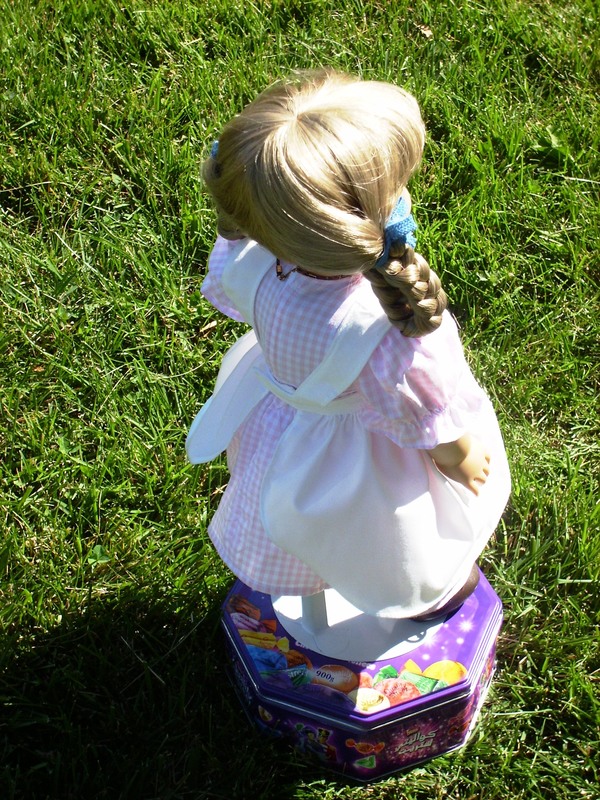 It was definitely too thick but I used it anyways as I really wanted to re-create Molly’s dress for Doll Clothing week. My seams are bulky. I didn’t line the sleeves because of bulk. Also, I didn’t add the lace to the sleeves to avoid more bulk. My other fabric issue was the velvet had a little bit of stretch while the lining was white quilting cotton which didn’t. So there was some fighting between the lining and the velvet but in the end, the pieces lined up enough that everything worked out. Cutting the velvet was a bit tricky too. I feel like it slide out from under my rotary cutter. Next time, I will try pinning and using scissors to see if that helps tame the velvet. All I can say is those 1950’s mothers must have really loved their daughters if they were setting the sleeves of a doll dress in the round. When I seen that in the instructions, it was so not happening. Especially after realizing the lining cotton and velvet were not getting along and that the seams will be bulky anyways. I put the sleeves in flat and it turned out alright. 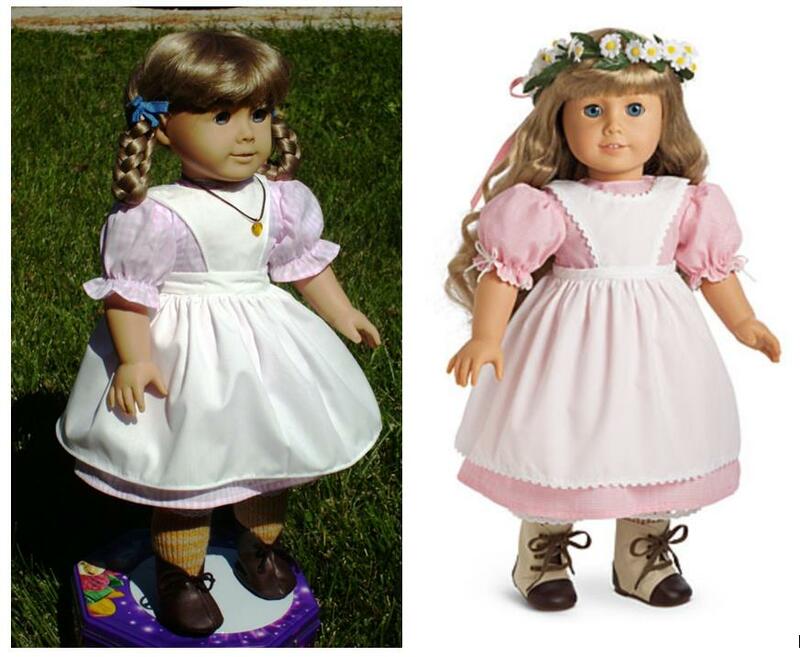 American Girl sold the dress on the left below for $24. I was able to recreate it for around $6. I know my final result is a close but not quite there (I ended up ordering one off of Ebay to have a closer look than I can get in pictures. From what I can tell, it looks like I need to drop the waist line of the dress, lengthen the sleeves, add extra buttons (which I can still do as there are more at home), and change the skirt. At first, I honestly thought it was A-line. Hopefully the closer look will help figure it out. 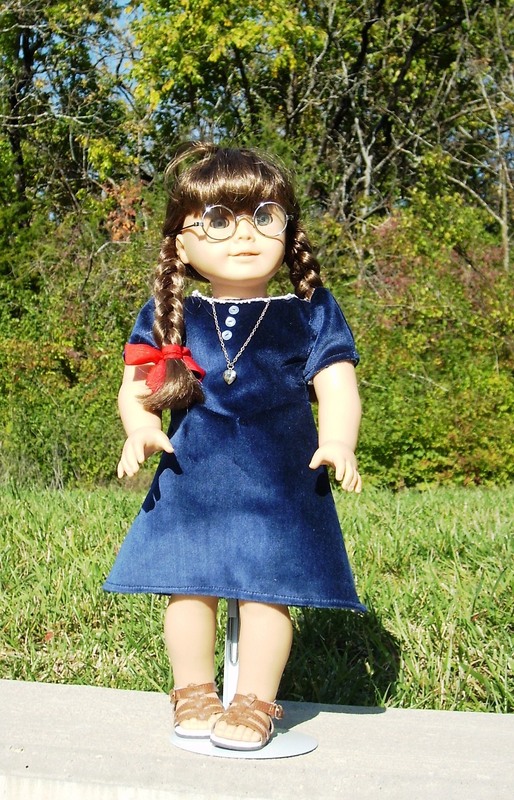 Today’s doll clothing designer is Shari Fuller at Thimbles & Acorns. 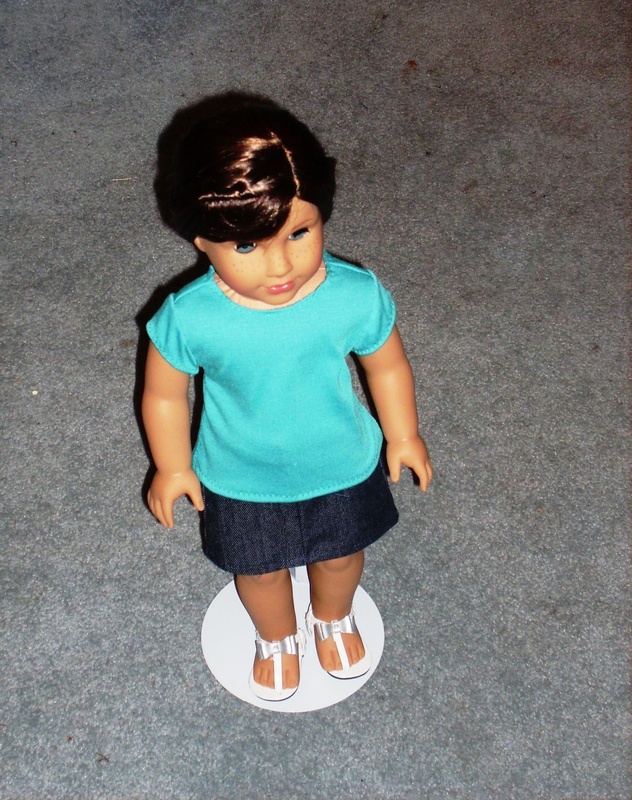 I have actually sewn just one of the ten or so patterns of Shari’s that I have. 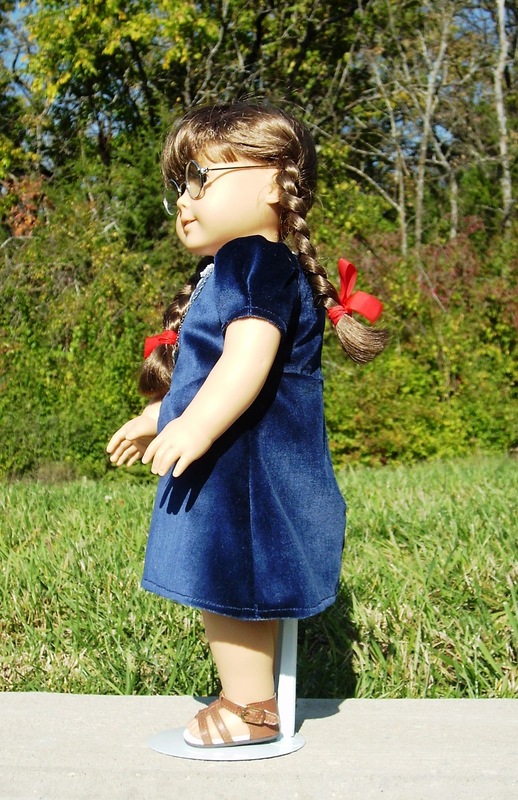 The details in the En Forreau gown are absolutely delightful and my Felicity doll looked beautiful in her dress. 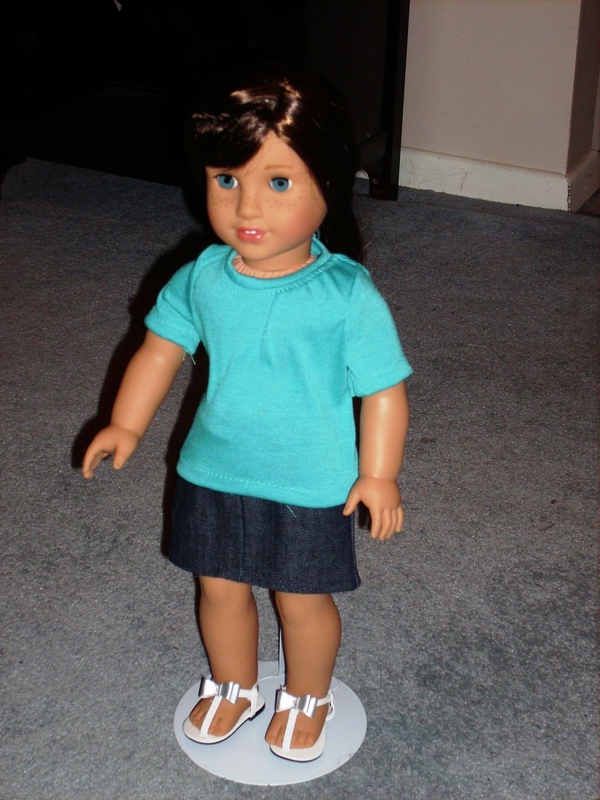 The first doll that I remember having was my little Dawn Doll. 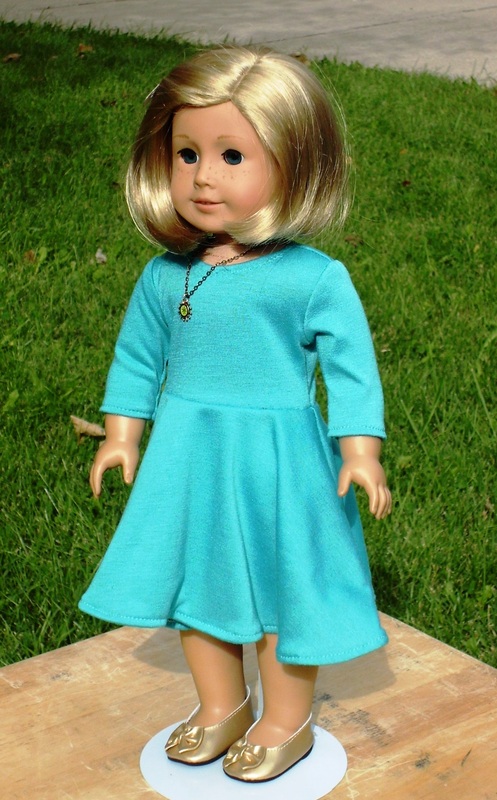 My profile picture shows me mending her dress… the first time I ever sewed! 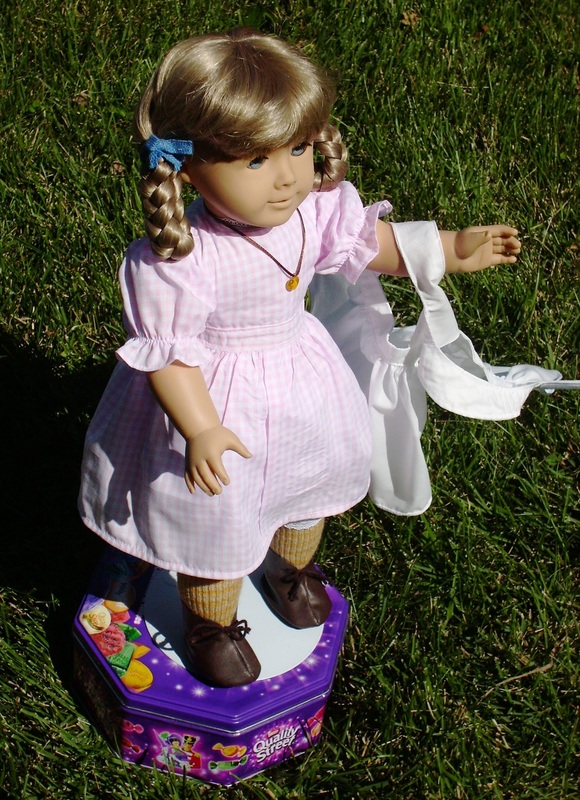 The most recent doll I got (well, I just bought it a few days ago and it hasn’t arrived yet), was a Laura Ingalls doll from the Queens Treasures. Laura Ingalls was my childhood hero, so I am rather excited to see her. My absolute must-have sewing notion is my seam ripper. I actually have about five of them, but still spend far too much time searching for one of them when I need it. My package of bobby pins comes in as a close second though… they are wonderful for turning narrow tubes. I would recommend my set of three Prairie patterns that I just released this summer to anyone new to Thimbles and Acorns. They are relatively easy to make, include both a Past and Present variation, and many of the pieces are interchangeable so there is a wide range of design options. 5. What is the next pattern you are releasing? Where did you get the inspiration for the new pattern? Currently, I am working on a series of Elizabethan Era dresses. The idea for this series stems from my work on the soon to be released Elizabethan doll from A Girl For All Time. I am really enjoying researching the different dress styles from this period and am rather fascinated by their unique construction. Check out Thimbles and Acorns’ website at Thimbles and Acorns. Slowly, I have been working away on completing pattern from Pleasant Company’s Kirsten’s Pretty Clothes. 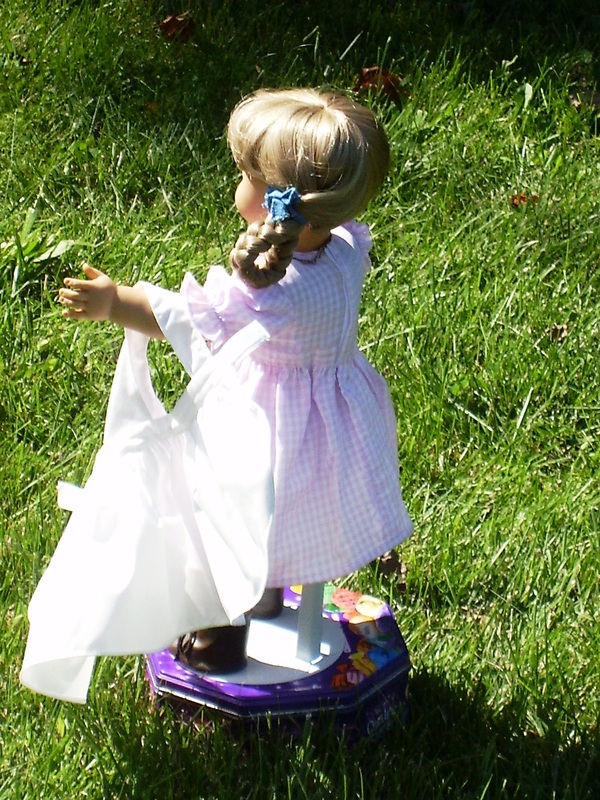 Previous featured on the blog have been Kirsten’s school dress, her pantalets, and her chemise. 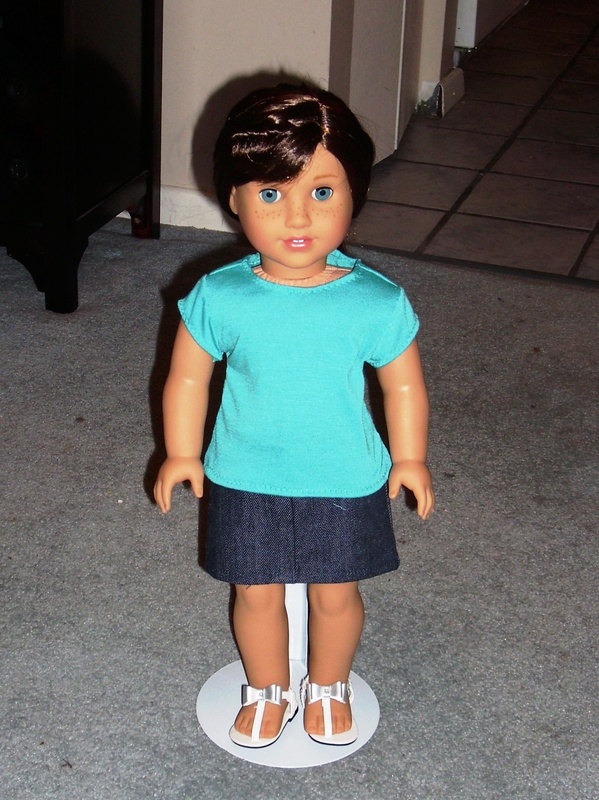 Today, I have Kirsten’s birthday dress for review. 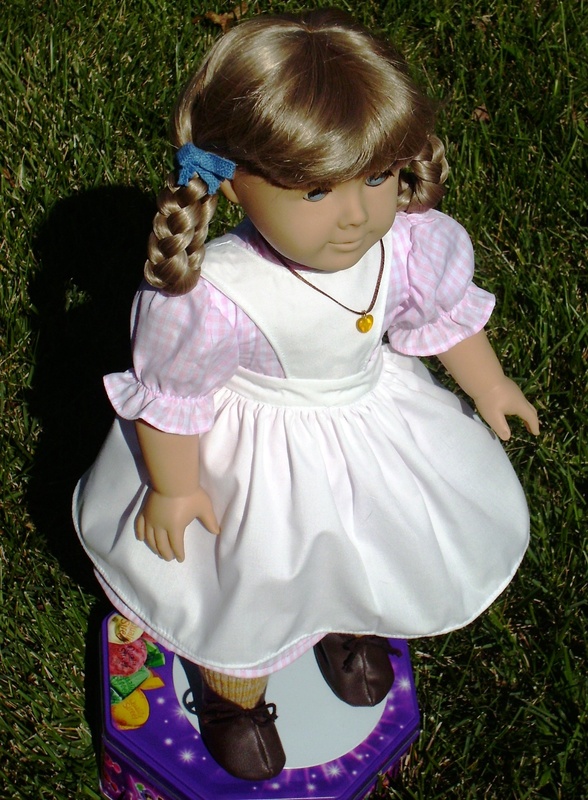 Just a reminder, I have the pdf version of Kirsten’s Pretty Clothes from AG playthings website. The pdf version is fairly easy to put the pattern pieces together. I haven’t had any problems cause by faulty pdf taping. I know that I also posted this before but Pleasant Company patterns don’t really have pictures to go along with the instructions. If there is a picture, it isn’t very detailed. The written instructions are great but if you are a visual person, you may have some troubles getting the dress put together. Also note, Pleasant Company patterns has the warning that the pattern is for experienced seamstresses only and children need the experienced seamstress’ guidance. 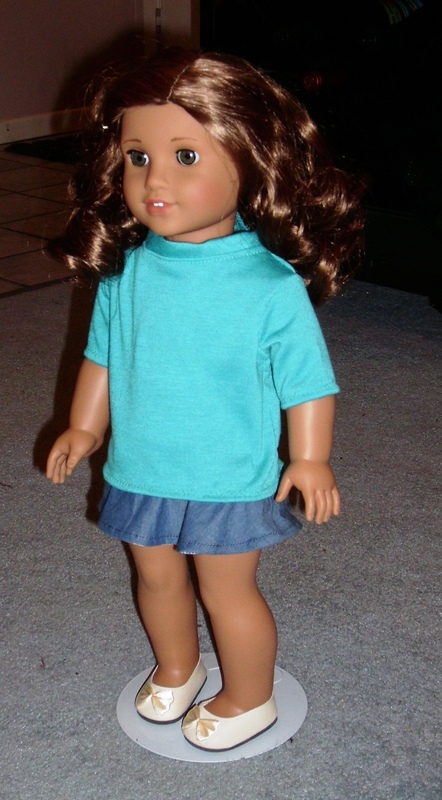 My Kirsten doll hasn’t had a new dress since March of 2014. So this time she is getting her birthday apron dress. The nearest craft store didn’t have any baby rick-rack so Kirsten doesn’t get any on her dress. On the sleeves, the pattern calls for 3.25 inches of elastic. The pattern calls for it to be zig zagged stitched on across the entire sleeve. The piece of elastic would not stretch across the sleeve. Instead I used a 5 inch piece of 3/8 inch elastic. It gathered like what I had seen on the pictures. I am not sure if this is because of differences in elastic or an error. 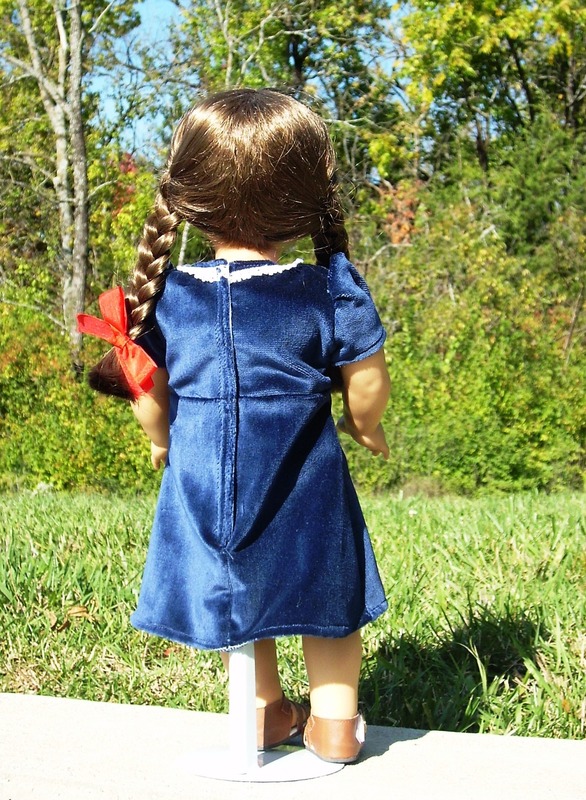 Alright, besides the elastic troubles, this dress has very little wearing ease for a doll. I think my waistband length was a little under 11 inches. 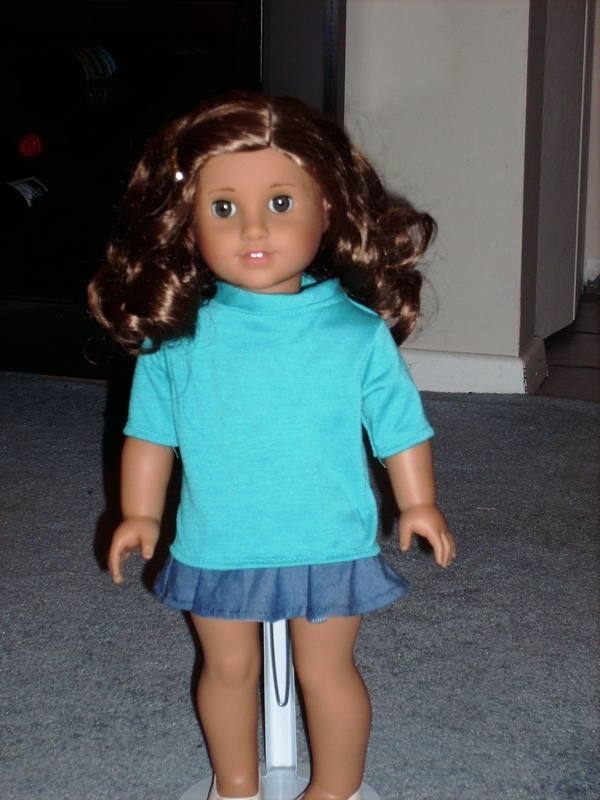 I actually had troubles getting this on my doll (please remember my Kirsten doll is from mid 1990’s so she is a bit bigger). 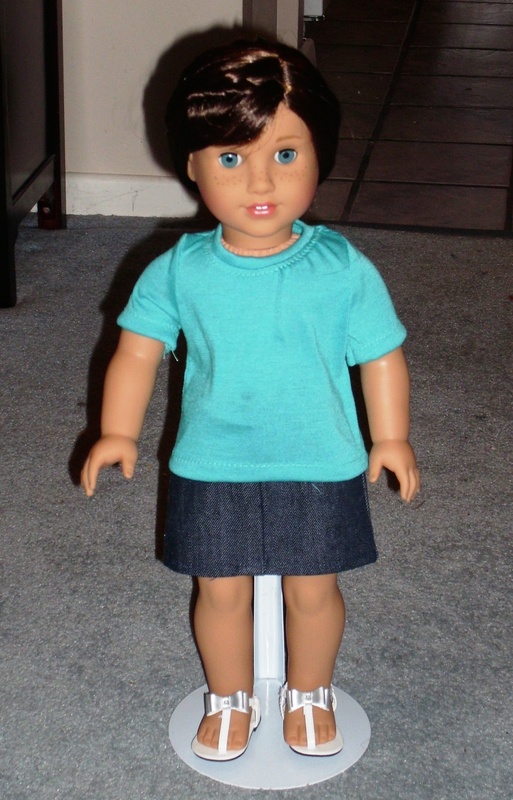 I seam ripped the back seam some and still felt like I was going to break my doll’s arm. It would probably be fine if the Velcro goes the entire length of the back. Otherwise, may be sewing just the last inch of the back seam together may get enough room to put the dress on. 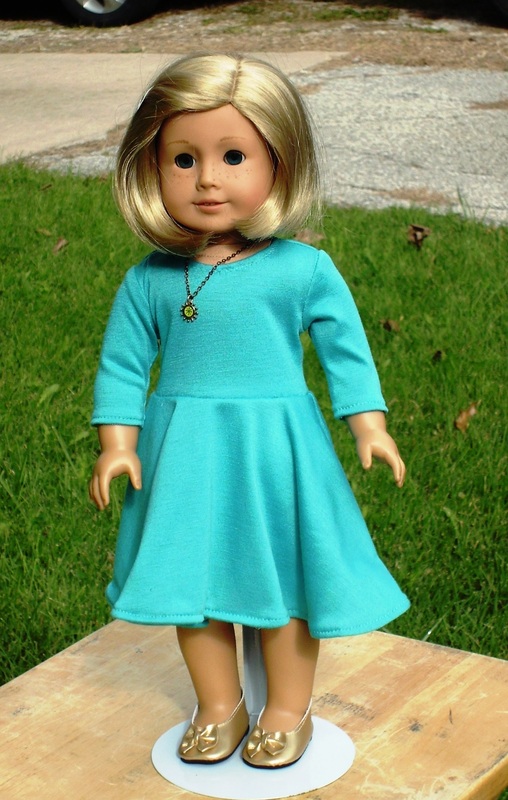 To be honest, I will probably end up re-making this dress for Kirsten with more wearing ease. 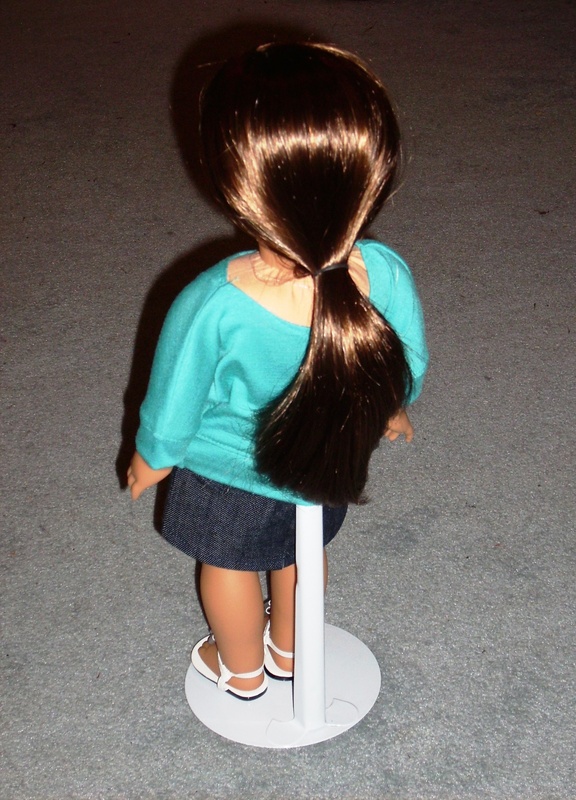 As of right now, I think she needs about a quarter to three-eighth inch extra. 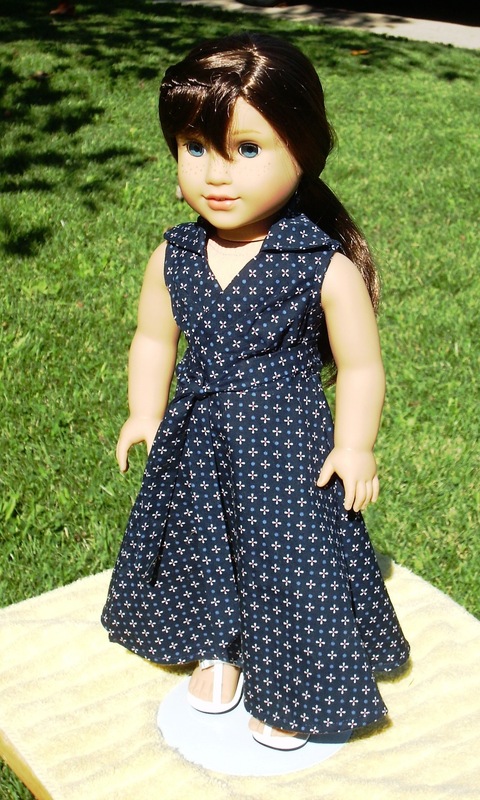 Definitely double check the pattern measurements against your dolls before making this one and decide how you want to put the dress on the doll. Next up was Kirsten pinafore apron. I decided to completely disregard the instructions since a lot of the hemming was to use the rick rack that I couldn’t get. 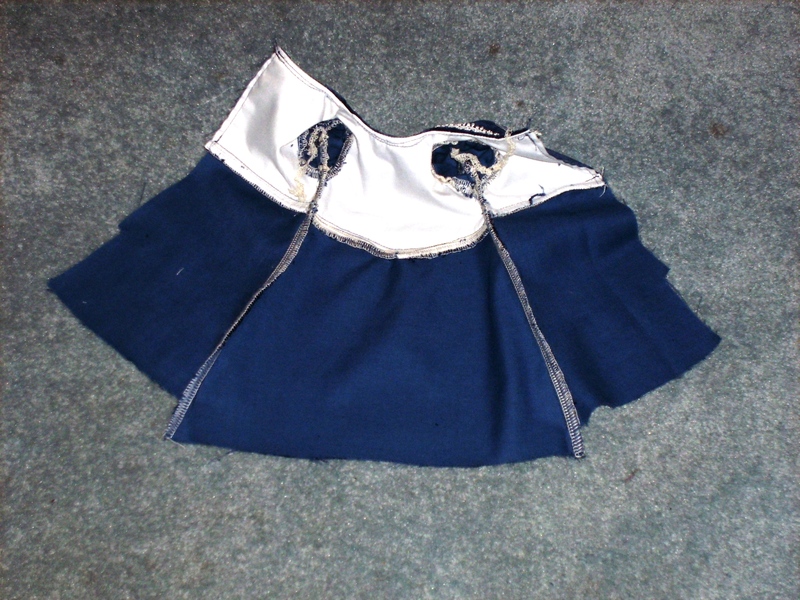 The top pieces of the apron (apron front, straps and waistband) were cut out twice so I would be able to line and get a clean finish for my doll apron. The apron went together fairly easily. I would recommend basting the bodice and the straps to the apron and check to make sure everything is straight when apron is on doll. I had to seam rip out the strap and untwist them. Like before, the narrow hem on the apron skirt was zig zagged stitched before rolling. It just makes it easier to have something with a bit of weight to hold on to. I switched out the closure from the 3/8 inch button listed in supplies to Velcro. The button just seemed to get lost in the waistband. Velcro also makes the apron a bit more adjustable if needed. The version sold in stores was $28. I was able to make my version of the dress for $3.00. The apron was probably around $2. For a grand total of $5. 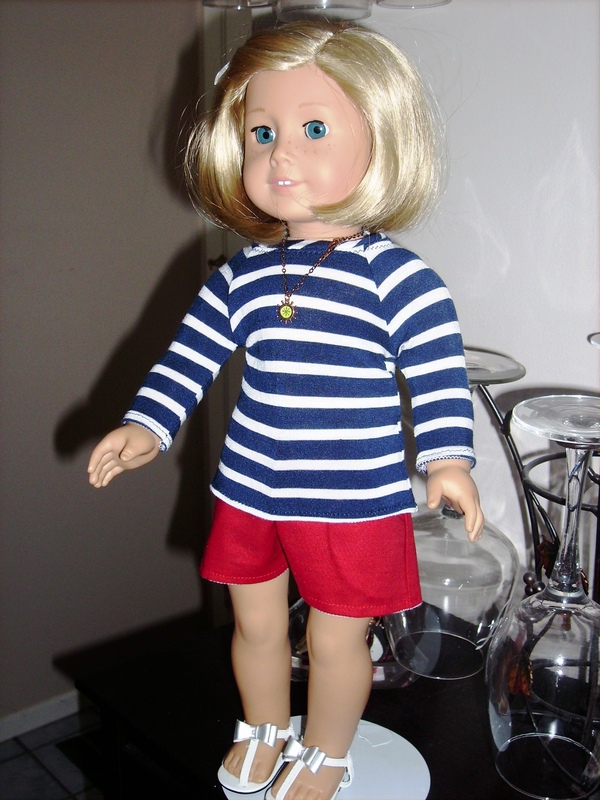 Switching up a bit, today’s Doll Clothing Week Post is for Bonjour Teaspoon’s Taylor Regatta dress as modeled by my Kit doll. 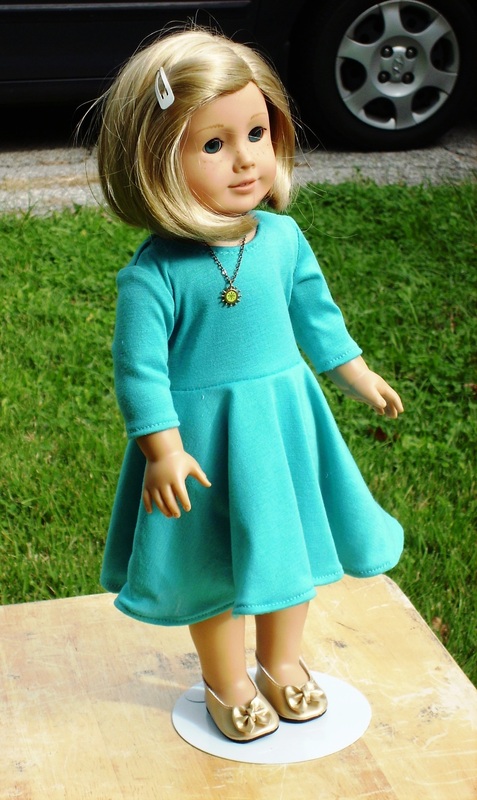 Plus keep reading for today’s Doll Clothing week Giveaway at the end! I still had plenty of teal poly/ lycra knit left, so I decided to use it. With that said, I feel like Kit’s dress is a little plain and she is in definite need of a larger necklace. So my recommendation to anyone making this dress is to either color block it, use a fun print, or both. The picture shows it in a stripe fabric which is very cute. The dress goes together easily. I think I had this finished in 1 1/2 hours including cutting. This is a nice quick to make dress which would be perfect for gifts. I had no problem in inserting the sleeves. The waistline was easy also. The skirt pieces are larger so if you are using scraps from a left over project, you may have to add a seam to the center front if you don’t have enough fabric to cut on fold. Today’s giveaway is a Pixie Pack of shoe soles. Please leave a comment below to be eligible to win. Giveaway closes on 12:01 am Friday (central time). 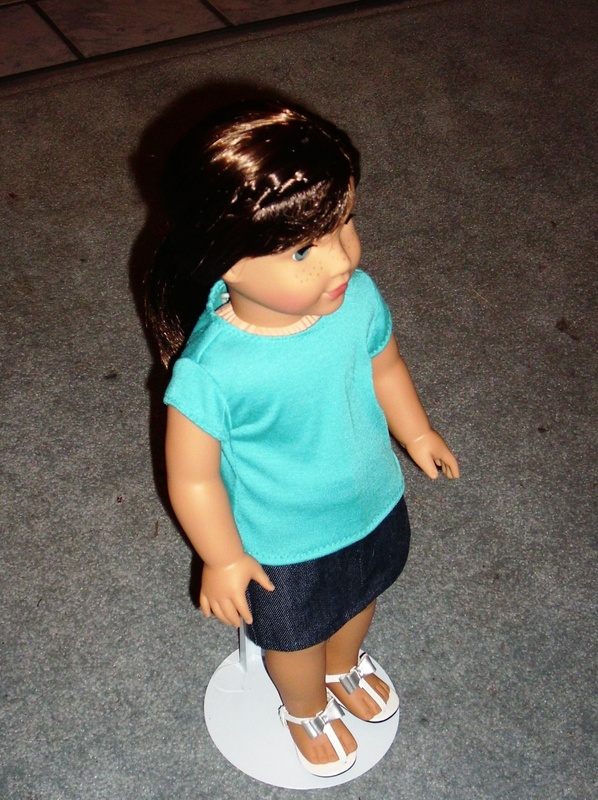 For the first ever doll clothing week, I was able to get a couple of doll clothing designers to answer a couple of “get to know you” type of questions. 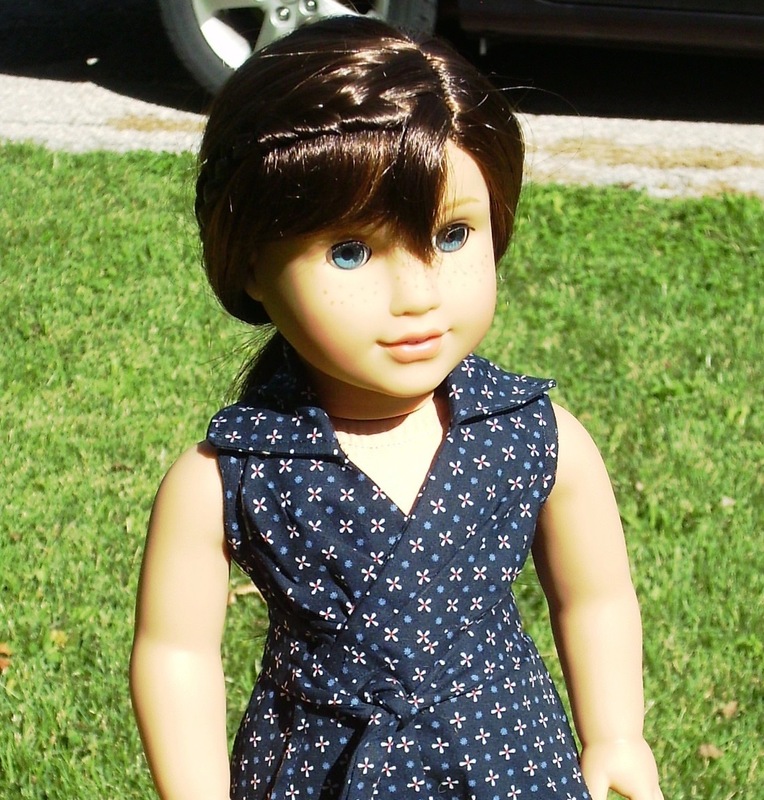 Today’s Doll Clothing Designer is Eve from Keepers Dolly Duds. 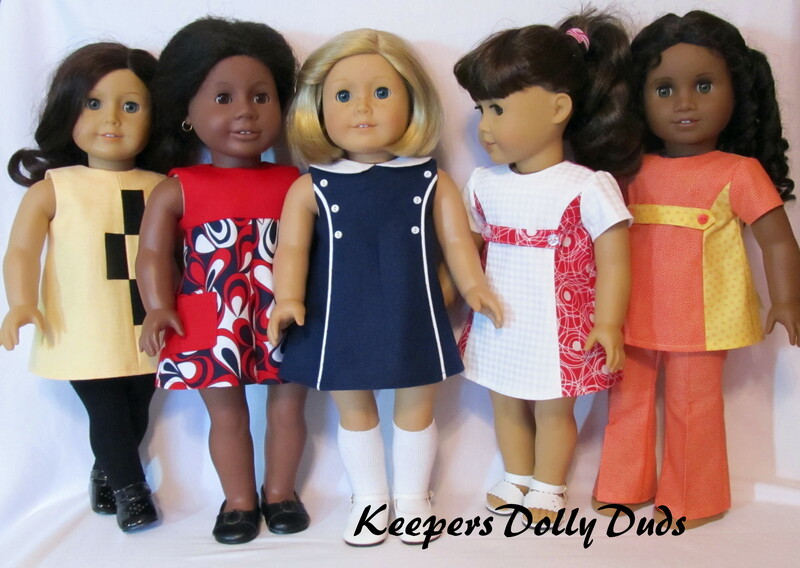 All of Keeper Dolly Duds patterns (except ones issued by Simplicity) are located on Eve’s Etsy store. 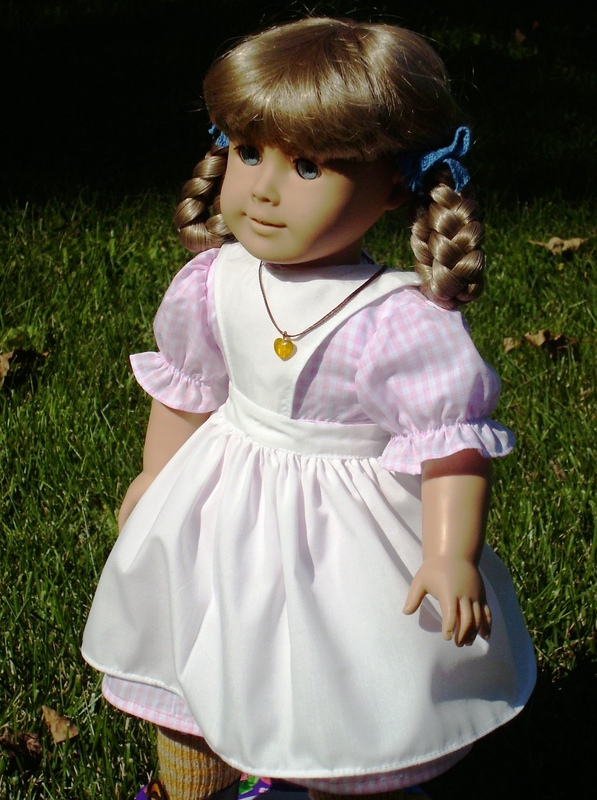 My earliest memory is of a baby doll that I sewed a dress for when I was four. I truly don’t remember what kind of doll it was. 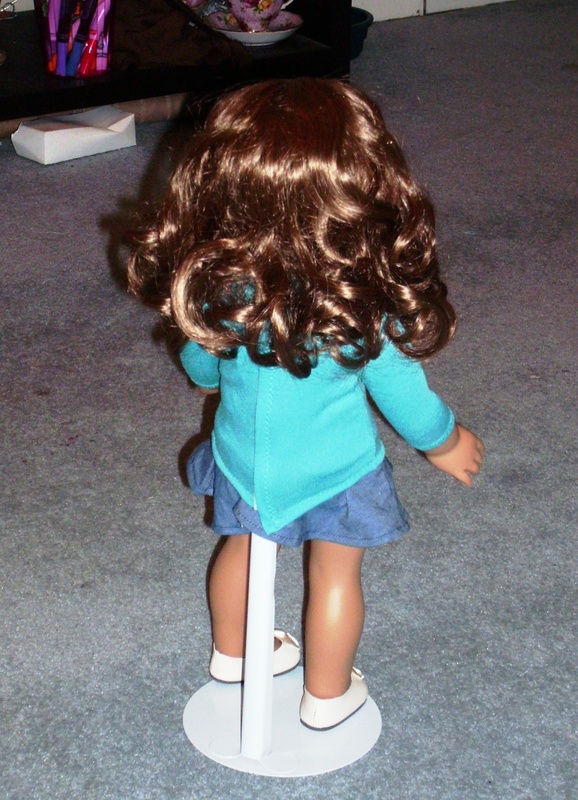 There were lots of doll in our house as I had four older sisters and later two more came after me. 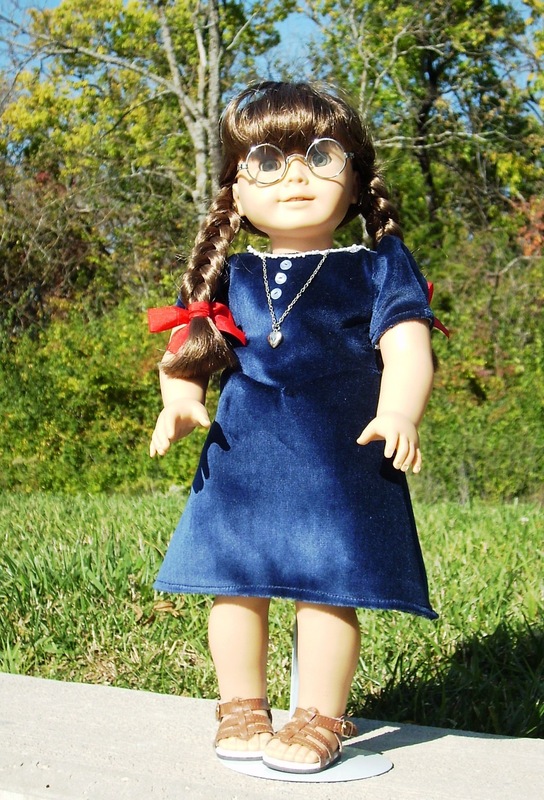 The latest doll added to my doll family is the 1960’s AG doll Melody. 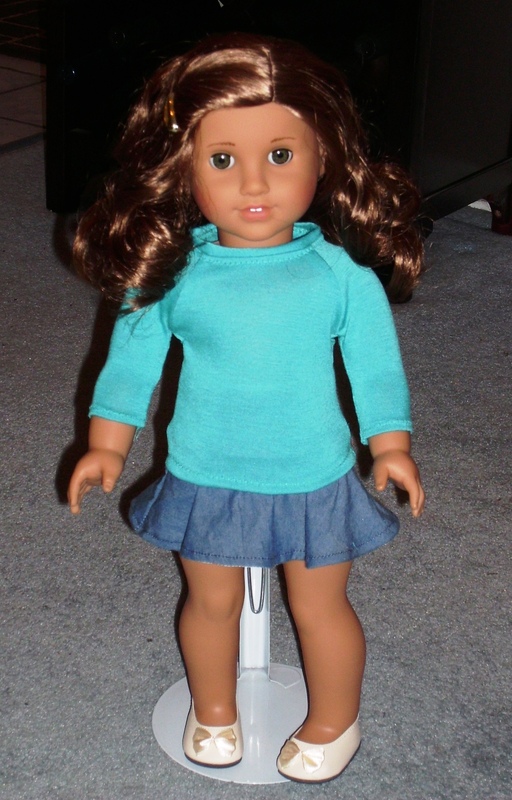 I am also awaiting the arrival of a doll named Nisha from the A Girl For All Time Doll Co.
Can’t decide on just one notion. I love buttons, lace, thread, needles, etc. etc…. and my thimble! Of course I truly love fabric as well. 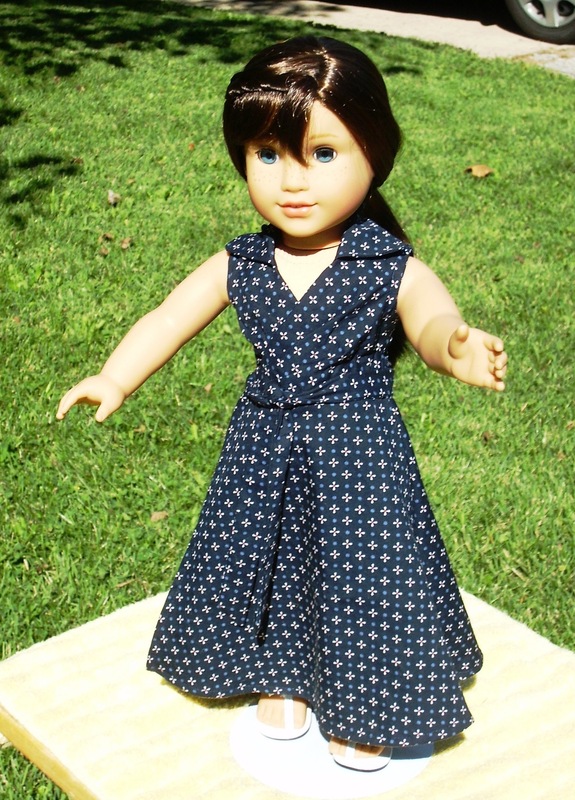 I would recommend to a novice seamstress KDD04-Fifties Flair as it is a basic pattern which one can use their imagination to add detail to. 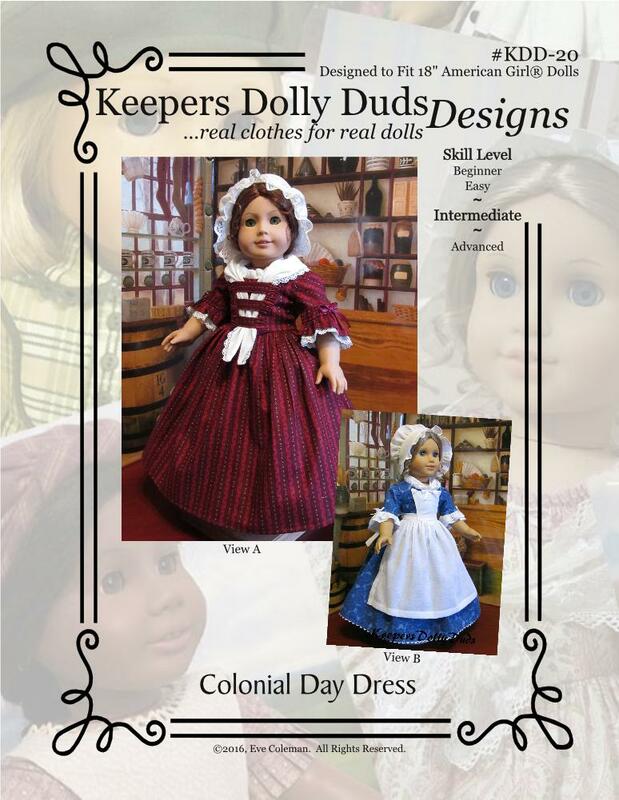 If it were someone who is more of an accomplished seamstress, perhaps they should like to try KDD20-Colonial Day dress, as there is lots of detail in that pattern. There are four patterns I have designed for Simplicity Pattern Company as well with a fifth to be released the end of this year or early next featuring 1960’s patterns. They are very basic but fun 60s styles and would be a good pattern for someone new to sewing. The next pattern I am releasing in my Etsy shop is KDD22-Train Station. It features a four piece outfit consisting of a pleated skirt with shoulder straps, a short sleeved blouse, a lined jacket and a coordinating hat. Hoping to have it completed in the next few weeks. This style is a classic design worn over many decades with little changes to the basic style. I felt it depicted every young girls wardrobe from the 30’s through to the 60’s. 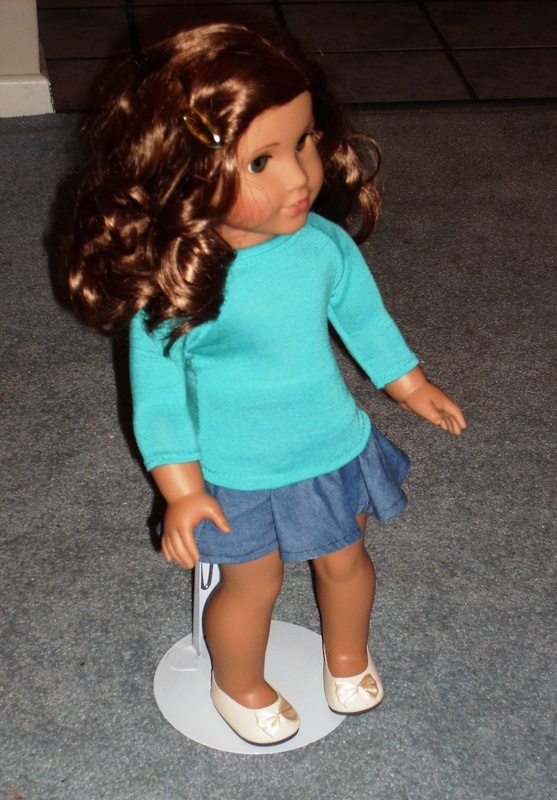 As I know that Melody will be coming home with me in Christmas, I will anxiously await that new Simplicity pattern. 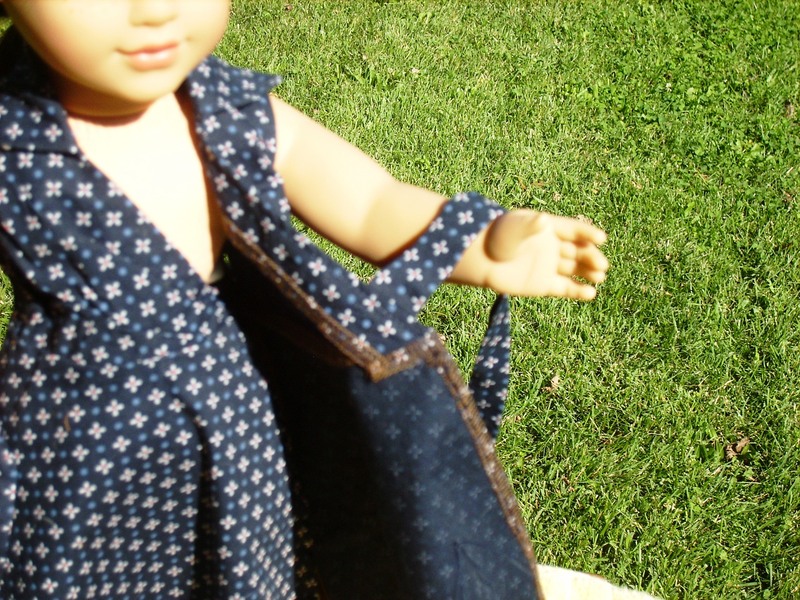 I am not sure what other pattern may end up in my doll clothing pattern collection. Thank you to Eve for answering the questions that I gave her. 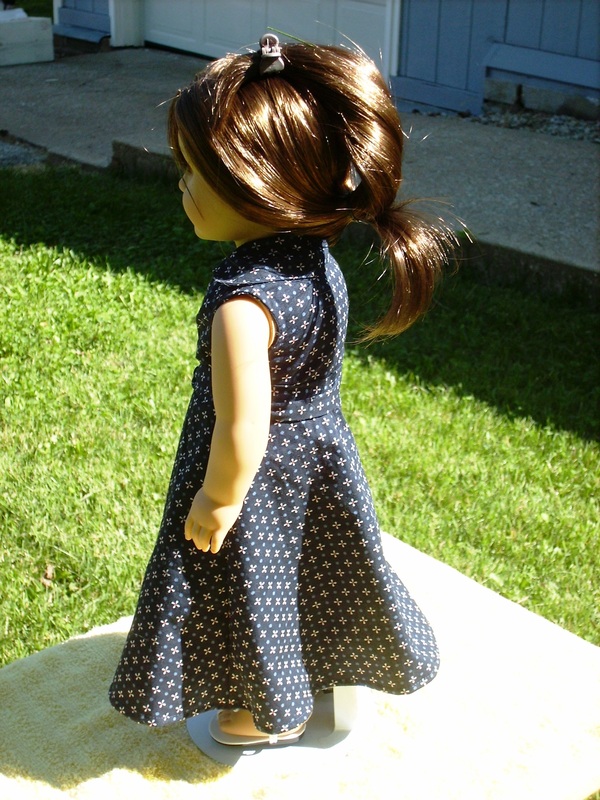 It is probably just fitting that I start Doll Clothing Week off with a pattern from a company that I really enjoy sewing. Today Grace gets to show off her new wrap maxi dress. I had a decent amount of left over navy Japanese cotton shirting from cutting out the Deer & Doe Bruyere for myself. It is rated as an easy/ intermediate level pattern. I have previously made this pattern before. 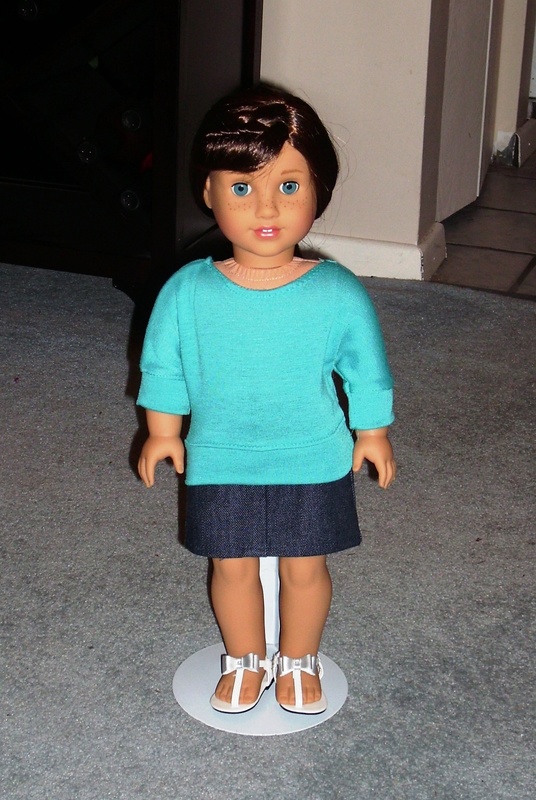 The blue cotton peplum wrap top went to a “Toys for Tots”. The second one is the long sleeve knit wrap top from scraps a friend gave me but I don’t think it was ever blogged. As to the pattern rating that would be fairly accurate. The instructions provide plenty of details and pictures to follow along. However, the wrap dress is definitely not this is my first time sewing ever pattern. One definitely needs to be able to sew curved seam fairly accurately before attempting. I cut out my pattern one night. Then it took me around three hours to get it all together (that was over two evening after work). I did have the instructions up on my computer and definitely used them for making the front bodice. In an absolutely silly cutting mistake, I cut two back pieces. 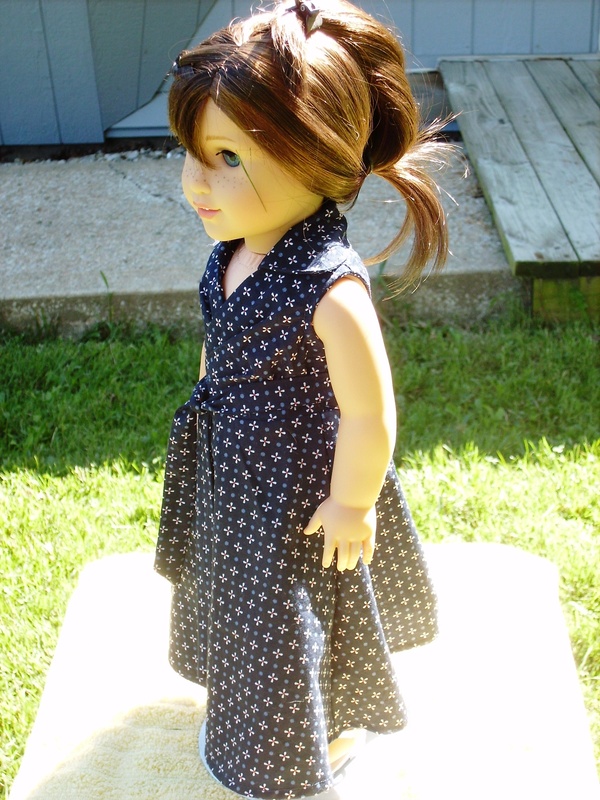 There is leftover cotton shirting so it is possible that there may just be a wrap peplum top in the future for the dolls. Otherwise, there wasn’t anything hard in the cutting stage. I clipped out the points for the wrap front and the front arm with regular fabric scissors instead of the rotary cutter just because of the tight radius. Also, as I was cutting out my pattern, I went ahead and cut out 1 inch wide bias pieces the length of my scrap fabric for finishing the arm on the sleeveless dress. I didn’t follow the order of the instructions exactly. I went ahead and put all the skirt pieces together first so there were fewer pieces on the dining table which means fewer pieces possible to fall on the floor and be tormented by the bunny (Lala does think that anything on the floor is his chew toy). Same applied to the two collar pieces and the front facing. Now that most small pieces were together, focus went to the front bodice. I tailor tacked the dots for the pleats. Then with my Chaco liner I connected the dots. I did vary from the instructions as I used my sewing machine to sew the pleats lines together instead of basting. I left the pleats sewn together in the end. Probably the biggest change I made was adding bias tape for finishing the arm area of the sleeveless dress. I have serged and turned under and stitched on previous versions. But with the tight curve of that area, the finish was fine but not my best work. This time I stitched the bias tape at the quarter-inch seam line. I turned it to the inside then folded the extra bias under the bodice and stitched. One inch bias was a bit too wide. Three quarter-inch or five eighth may be better if you decided to do this. 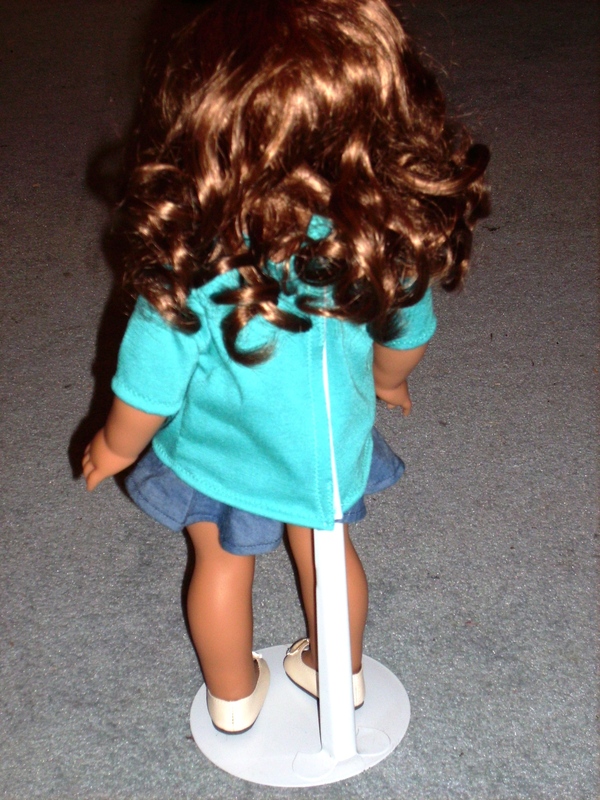 Last part of the instructions (besides how to dress your doll) has you top stitching the seam allowance on the skirt down. I started my top stitching a bit higher up just so I made sure to be able to tack the front facing down well. My top stitching starts right above the ties for the dress then continues down to the hem. 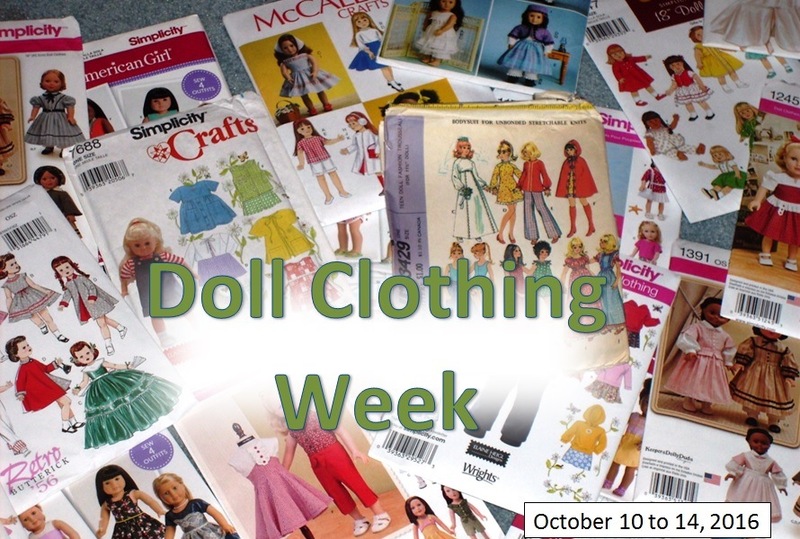 As a kick off to the first ever Doll Clothing week, we start off with a giveaway. There will only be 3 giveaways unfortunately. Today’s giveaway is for 3 yard of thin Velcro. This is the Velcro I use on all my doll clothing and just love it. Here is the description from Farmcookies’ Etsy shop, “It is 3/8″ wide and less than 1/8″ thick to reduce all that bulk in the back of your special creations. The hook side of the Velcro is on one side and the loop on the other. You simply cut two pieces and sew one side up and the other side down. An added bonus of this Velcro? 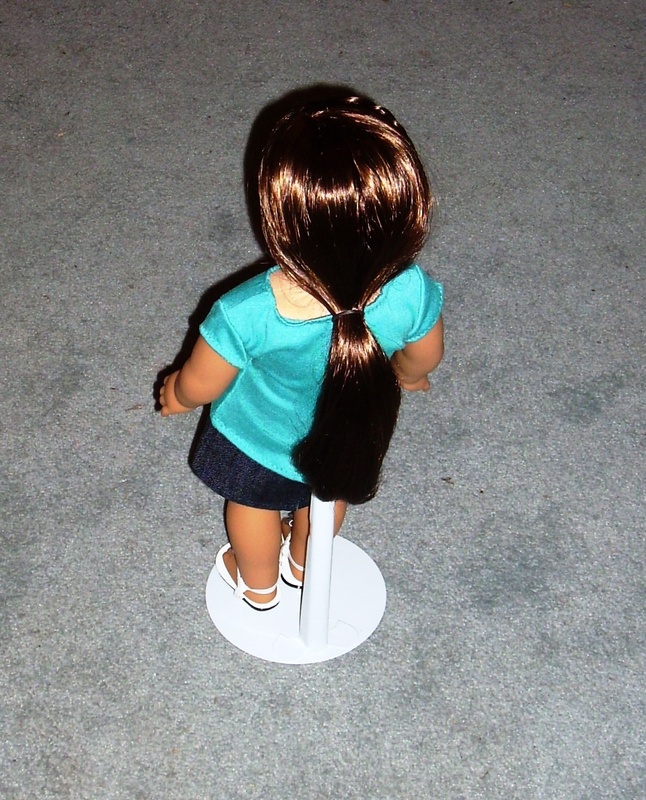 Since it is so soft, it does not snag your doll’s hair.” If you would like to enter, please leave a comment below. Comments posted by midnight (Central time) on Tuesday will be entered to win the giveaway.